I LOVE French Onion soup! On rare, special occasions, my Mom would make it from scratch and serve it in those classic cute shaded brown bowls. It was always a real treat and incredibly yummy. 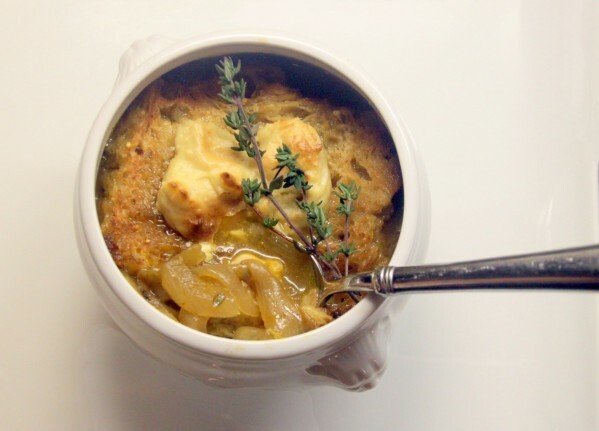 Most onion soup recipes are beef based, have real cheese AND use gluten-full bread. I love a cooking challenge so I thought I’d give it a whirl and make this vegan and gluten free. Outcome? SUCCESS!!! I actually made this all in ONE pot. My Instant Pot! It was SO easy! If your slow/pressure cooker sautés like mine, you can do this in one fell swoop… if not, a soup pot on the stove works too! As I’ve mentioned on the blog, I was taste-testing with my folks while they were in town. This dish was another big hit with them! They were VERY impressed with the ‘cheese’ and loved the flavor of the soup. About the ‘cheese’… Although I don’t eat dairy now, I used to. This is possibly my FAVORITE vegan cheese. It also works as a creamy buffalo-style mozzarella on my cauliflower pizza (recipe coming soon!) I’ve also been known to eat the leftover straight from the pot, it’s THAT good! As for the bread, please use whatever you like or have on hand. I had some home made gluten free bread so I used that and it worked great! I hope you enjoy this recipe as much as I do! I love hearing from you. Please let me know what you think in the comments below! Heat the oil in a large soup pot over medium heat. Sauté the onions and garlic and salt until translucent the onions are translucent (15-20 minutes). Add the wine, broth, vinegar and salt and bring to a boil. Simmer for 30-45 minutes, until well combined. Ladle into soup bowls and top with a slice of toast (gluten free optional) and a dollop of vegan cheese (recipe below) and put under the broiler for 3 minutes, until the cheese is browned on top. Blend everything in a Vitamix or blender until completely smooth. Heat in a small saucepan over medium heat, whisking frequently until thick and has the texture of melted cheese, about 5 minutes. Hi, you said it was made in your IP, but the directions are for the stovetop? * let the pressure release for another 10-15 and done! You can still broil with the cheese and bread as per the rest of the directions, I think it comes out really delicious that way. You said a box of vegetable broth. I’m thinking this is a large box? Thanks. You’re right! I used a large 32-oz box. I updated the recipe with that note.